Landscape index is an effective approach to capture the information for landscape pattern. In urban expansion, the spatial relationship of newly grown urban patches to existing urban areas reflects the properties of urban expansion evolution. However, existing metrics cannot comprehensively express the spatial distributions of all new patches relative to old patches, lacking quantitative reflection of spatial relationship gradient of outlying new patches to old patches. We propose a new landscape metric, multi-order adjacency Index (MAI), to depict urban expansion degree by adjacency degree based on distance between new and old patches and boundary-sharing rate. The two characteristics of MAI are shown as follows: 1) The value of MAI is continuous for reflecting the gradient of expansion degree of new patches. 2) MAI has clear physical meaning for representing actual distance between new and old patches, and the landscape expansion types are then redefined by MAI. Meanwhile, the two variants of MAI, mean multi-order adjacency Index (MMAI) and area-weighted mean multi-order adjacency Index (AWMMAI), are designed to capture information for the dynamic process of urban expansion from a bottom-up view. Based on four period’s remote sensing images (1995, 2000, 2005 and 2010) of Wuhan, we applied MAI for characterizing the change of landscape pattern. The following results were obtained: 1) The variation trend of the number for each expansion type show a tendency to decrease first and then increase except distant leap type that present a dramatic increasing trend; 2) The spatial pattern of Wuhan was more compact in the beginning, and became more and more dispersed along with urban expansion; 3) The result of MMAI indicate average expansion degree increased in the dynamic process of urban expansion, and the change trend of AWMMAI shows that the global spatial pattern of Wuhan city is dispersed in a general trend, but has a direction towards the compact development during 2005-2010. By comparing MAI and other dynamic metrics of urban expansion, we found that MAI can provide information more precisely than others in reflecting the gradient spatial relationship. At the same time, MAI improved the recognition of landscape expansion type and made up for the lack of quantitatively distinguishing the urban patches with larger urban expansion degree by the existing measurement methods. MAI also inquired into the spatial pattern change characteristics of urban landscape expansion in a deeper level. MAI provides a better perspective to understand the hidden mechanism of the spatial characteristics of urban expansion. Future research will include analysis and verification of the growth of the outlying seed regions. The simulation model of urban expansion by using MAI could be discussed for predicting the farther urban expansion. MAI is also expected to be a practical measurement to generalize in other cities or scales for better understanding urban expansion dynamics and analyzing problems of urban spatial pattern. It is important for airport hubs to establish wave-system structures in optimizing scheduling and enhancing operational efficiency so that airport hubs can significantly increase the number of passengers and intensify flight connectivity. Hence, this article proposed a research method that can be employed in the study of wave-system structures. With the research method, we surveyed wave-system structure for top 10 airports. This article then investigated spatial patterns of possible indirect connections for airport hubs whose wave-system structures were explicit. Some conclusions can be summarized. First, Capital Airport (Beijing), Pudong Airport (Shanghai), Baiyun Airport (Guangzhou) and Changshui Airport (Kunming) have adopted clear wave-system structures. But wave-system structures of Shuangliu Airport (Chengdu), Baoan Airport (Shenzhen) and Xianyang Airport (Xi’an) were not clear. Second, the large number of flights is a necessary, but not sufficient condition for the establishment of wave-system structures. It is important for airport hubs to optimize connection waves so that they can better utilize their temporal recourse. Third, possible indirect connections of Capital Airport (Beijing), Pudong Airport (Shanghai) and Baiyun Airport (Guangzhou) were spatially different. In general, their spatial patterns did not follow the rule of geographic proximity, but they were related to the network expansion of flights. At present, China’s city innovation system is gradually taking shape. As the core component of innovation resources, innovative technology represented by patents has become the focus of competition among all cities. Its gathering and diffusion channels urgently need to build a compatible city technology transfer system. The construction of a national technology transfer system in line with the law of science and technology innovation, the law of technology transfer and the law of industrial development is an inevitable choice for serving the strategy of innovation development. Based on data mining from National Intellectual Property Office of China, the heterogeneities and its evolution characteristics of city innovation network depicted by patent transfer in topology and space from 2001 to 2015 were sketched using lots of visualizing tools such as Pajek, Gephi, VOSviewer, ArcGIS, and so on. Topologically, from 2001 to 2015, with the increasing number of cities involved in technology transfer, China city innovation network has emerged a significant small-world feature with the smaller average path length and the extremely large cluster coefficient compared to its counterpart. In addition, the entire network presents a core- periphery structure with hierarchies, which dominated by Beijing, Shanghai and Shenzhen. Spatially, the quadrilateral pattern of China city innovation network based on the triangular structure is gradually formed. Last but not least, the growth mechanism of city innovation network were also verified by correlational analysis, negative binomial regression approach and gravity model of STATA. The growth of city innovation network in China is significantly related to the technological innovation strength represented by the number of patent application. The findings further confirm that geographical distance has weakened cross-city patents transfer. Meanwhile, the similarity of economic development and industrial structure between cities are also important factors influencing the growth of city innovation network. As a hub connecting rural with urban areas, industrial structure optimization of small towns is significant to the local urbanization of farmers and to prevent the excessive concentration of population in big cities, and is also one of China's new urbanization problems in reality. This article reveals distribution characteristics and spatial differences of industrial structure of small towns in China in 2015, and puts forth influencing factors of proportions of non-agricultural industries of small towns in China by weighted least squares method. It is concluded that rates of non-agricultural industries have a normal distribution in small towns of China, and towns with higher rate of non-agricultural industries are mainly concentrated in China’s eastern coastal areas, the Yangtze Economic Belt and frontier port areas. The proportion of non-agricultural industries of small towns in the eastern region has a negative skewness distribution, and that in the central region has a normal distribution, while that in western and northeast regions have positive skewness distributions whose industrial structure is relatively backward. Shares of non-agricultural industries of small towns are positively correlated with size of small towns and country economic development level. The secondary industry in the county area has a slightly stronger driving effect than tertiary industry, and small towns always provide supporting services for the development of secondary industry in its county area. The diffusion effect of the expansion of prefecture-level cities (regions, autonomous prefectures and league) is stronger than its siphoning effect on the industrial structure upgrading of small towns. Since the "Belt and Road" initiative was put forward, the marginal analysis of trade growth between China and countries along the "Belt and Road" has gradually become a hot topic in the academic research. But in fact, a detailed classification of China's exports of various types of products exported to countries along the "Belt and Road" is the key to understanding China's export growth patterns. In the article, based on the international trade data of HS-92-6 from 1995 to 2015 provided by the CEPII BACI database, we respectively examined the ternary margins of China's manufacturing exports to the 7 major regional along the "Belt and Road" and China's manufacturing exports to the top 10 trading partners along the "Belt and Road" by using a detailed classification from a regional perspective and a country perspective. Certainly, we also use the nuclear density estimation technique to analyze the dynamic evolution of ternary margins of China's export. The results show that: Firstly, no mater whether it is from a regional perspective or a country perspective, China's expansion of various types of products exported to countries along the "Belt and Road" mainly occurred in 1995-2001 and 2001-2008. Secondly, in the post-financial crisis period, China's export growth patterns of various types of products exported to countries along the "Belt and Road" was mainly characterized by quantitative expansion, supplemented by price expansion, and the category expansion was no longer obvious. Thirdly, the quantitative expansion is more significant from a regional perspective, while the category expansion and price expansion are more significant from a national perspective. In fact, we find that, in terms of manufacturing exports, price growth is the core of China’s export growth to countries along the "Belt and Road", and the relative prices of Chinese manufacturing exports have generally surpassed the world average during the post-financial crisis, even when exporting to developed countries like Japan, the price growth rate also showed a relatively strong trend. Finally, in the dynamic evolution, no mater whether it is from a regional perspective or a country perspective, the marginal characteristics of different product sectors show great differences. The polarization of price margin of China's export is more significant. In general, China's export growth patterns to countries along the "Belt and Road" shows a large heterogeneity at the national and regional levels. Different types of products have different export growth patterns, even the same type of products also have different export growth patterns at different times. In addition, we find that China's export growth patterns to countries along the "Belt and Road" is undergoing significant changes during the inspection period. In particular, the breadth-growth effect of exports is gradually being replaced by the effects of quantitative growth and price growth. ：The concepts of innovation, coordination, green, open and sharing are the keys to the development of China and even the future. Green development is the main tone of the 13th Five-Year Plan of China, and it emphasizes on the mutual unity and coordinated development between economic growth and environmental protection. It is a kind of human-oriented way of sustainable development. Improving the efficiency of green development is an important way to achieve the ecological civilization construction and transformation of economic development the important way. This study used the spatial analysis methods, such as the Super-SBM model, spatial autocorrelation, spatial variation functions and spatial durbin model to measure the green development efficiency from 2005 to 2015 in China (Tibet, Hong Kong, Macao and Taiwan are excluded), by building an input and output index system of green development efficiency. In addition, from the perspective of geography space, it revealed the spatial pattern and spillover effects of green development efficiency in China. The results showed that: 1) From 2005 to 2015, the efficiency of China’s green development is characterized by the stage characteristics of ‘stable at beginning, then fast and last stable again’. It shows an overall upward trend with large differences among regions. The regional differentiation of the ‘East-Central-West’ stepwise decreasing and the ‘South-Central-North’ symmetrical distribution, and ‘T’ shaped shaft development pattern is particularly evident. 2) There is a positive correlation between green development efficiency, the degree of spatial agglomeration gradually decreases, the hot spots increase, the eastern coastal areas form stable hot spots, and the central and western parts form stable cold spots. 3) The spatial self-organization of green development efficiency is more and more strong, the space difference is gradually increased, the structural differentiation caused by spatial autocorrelation is more obvious, the spatial heterogeneity caused by random components is gradually weakened, and the space between northwest and southeast Significant difference. 4) There is a significant spillover effect of green development efficiency, a significant positive effect on the level of economic development, and a significant negative effect on industrial structure, urbanization and technological innovation. Trying hard to explore the law of spatial evolution of green development and provide a reference for the coordinated green development of the three systems of regional economy, society and environment. The public participation in environmental regulation based on the 12369 environmental complaint data of the Yangtze River economic belt is taken as the research object. Taking the city as the research scale, the spatial analysis method is used to reveal the spatial and temporal pattern of public participation in environmental regulation. The dominant driving factors of public participation in environmental regulation are screened by Geodetector. Using GWR（geographically weighted regression）model to reveal the spatial heterogeneity of each dominant driving factors, such as economic level, industrial structure, human land pressure, emission intensity, informatization level, and environmental risk. The results show that: 1) The public participation in environmental regulation in the Yangtze River Economic Belt has significant spatial positive correlation, and the spatial agglomeration degree has decreased significantly in 2015. 2) The spatial pattern of public participation in environmental regulation in Yangtze River Economic Belt is basically stable in 2013-2015. The most area of the Yangtze River Delta city group, Wuhan and Nanchang in the middle reaches of the Yangtze River City Group, and small area of Chengdu Chongqing city agglomeration are the high intensity zone of public participation in environmental regulation. 3) The factor detection results from Geodetector excluded two primary variables: fixed assets investment per square kilometer and the number of college students per tens thousands of people. 4) The OLS model fitting results show that the driving force affecting the public participation in environmental regulation intensity followed by environmental risk factors, human factors, stress intensity factor, the informatization level of emission factor, economic factor, and industrial structure factor. In addition to the industrial structure and the level of information, the other factors are positively correlated with public participation in environmental regulation. 5) Multinomial parameters show that the GWR model of public participation environmental regulation intensity in the Yangtze River Economic Belt is better than the OLS model. 6) The GWR model fitting shows the driving factors of spatial heterogeneity, and spatial heterogeneity of each driving factor has the difference, provides a theoretical basis for environmental regulation policy and public participation intensity differences for different regions to take. The GWR model fitting results show the difference from spatial heterogeneity of each driving factor, and provides a theoretical basis and targeted strategies for of environmental regulation in different regions. The space pattern of urban population distribution is a classical research topic of urban science and urban planning. In terms of the current research situation of urban population distribution, the LBS big data technology which is considered as a new method and tool to observe the urban spatial and temporal characteristics is introduced into the research of urban population distribution based on the traditional space syntax model. Then, a new idea of urban population distribution research with the integration of theoretical distribution and actual distribution is established. The case study in the central urban area of Hefei City shows that: the spatial clustering areas obtained respectively by space syntax model and LBS big data analyses are different in space. According to the comprehensive comparison of space syntax model and LBS big data analysis, the central urban area of Hefei City is divided into 3 types of population distribution including high density, medium density and low density. The high density zoning consists of the old town, Shushan district and Baohe district. The medium density zoning includes Binhu district, Luyang district and High-tech area. Meanwhile, the low density zoning consists of economic developing area and Yaohai district. Finally, the suggestions of population distribution development in different density partitions are proposed. The research shows that the timely and dynamic characteristics of LBS big data can make up for the shortcomings of traditional data and greatly broaden the source and timeliness of basic data. Obviously, this will enhance the accuracy of the study. And, more importantly, it will provide more accurate and efficient tools and methods combined with the classical space syntax model for the study of urban population distribution. In addition, it is hoped that this research can make some exploration and reference for expanding the practical application field of LBS big data. With China’s rural transformation development, the rural space is facing a significant reconstruction. This article analyzes the process and mechanism of spatial reconstruction of "Fengjian" in Xingtan Town, Shunde District, Foshan City by using the theory of actor network. The results shown that this village had experienced two stages: the construction phase of the tourism-type beautiful countryside and the operation phase of cultural tourism-type village. With the local government acting as the key actor, the actor network of the construction is authority-based and realized the reconstruction of the ecology, living and production space. The operation phase of the network has changed, with the village committee, villagers and other lower-level actors gradually gaining more right to speak, which increased the public space and promoted the transformation of functional space. The mechanism of the actor's network transformation is mainly due to the change of the key actor's purpose, the adoption of the community empowerment (changing the way of enrolment), and the change of the actor's role in the network. As the actor network is in a dynamic process, rural spatial reconstruction is also a continuous process. The reconstruction of the rural space caused the dissolution of rurality. But under protection of the government and the villagers with high awareness of the reserving rural nature, a good demonstration of balancing the villagers’ interest and rurality was present. Former studies on knowledge spillovers often deal with aggregate data at regional level. However, the observed knowledge spillover comes from spatial interaction among micro entities, and needs to be examined microcosmically in nature. This article, employing micro data of Chinese manufacturing firms above designated size in 2005, analyzes spatial effects of firm knowledge spillovers in the Yangtze River Delta. Firstly, this article identifies geographical coordinates of all firms from Baidu API by R language program, and then calculates the point-to-point geosphere distances among firms. Secondly, with a step of 1 km in a range of 0-100 km, this article explores spatial point pattern of firms with DO index. This article discovers that R&D firms are significantly clustered within a scope of about 20 km, then disperse as distance increases, and tend to accord with the spatial distribution of all the manufacturing firms in the end. This article compares the results with those drawn from EG index calculated at various regional levels under Monte Carlo simulation, and finds that R&D firms are significantly agglomerated at village, town or county levels. However, at city level, firm agglomeration is not significantly observed. The significance level becomes lower as regional level gets higher. Thirdly, this paper constructs spatial contiguity relationships based on threshold distance. To observe how spatial effects of knowledge spillovers vary as distance increases, this paper set multiple threshold distances step by step from 5 km to 100 km, with a step of 5 km. With the package of spdep in R language, this article analyzes the spatial effects of knowledge spillovers at individual level in continuous space based on knowledge production function. This paper finds that, within range of 0-100 km, the spatial effects of firm knowledge spillovers decrease more and more rapidly, and can be described with a fitted function of negative exponential power. Beyond 40 km, the effect of knowledge spillovers moves down a stable low level. This shows that the spatial extent of firm knowledge spillover may be within a distance of about 40 km. Compared with micro data analysis in continuous space, aggregate data analyses based on regional analysis exaggerate the effects of knowledge spillovers. With the analysis of micro data, this article can avoid the modifiable area unit problem effectively, which is a big trouble appearing in the studies based on aggregate data. Under the limitation of the capability of computers, this paper only analyzes the firm data of the Yangtze River Delta in 2005. Subsequent researches can expand the spatial extent and prolong time duration to obtain more general results. After the financial crisis in 2008, a new phenomenon “shrinkage” has appeared in Dongguan’s urban area, which manifested population size reducing in its towns. Although the economic recovery rapidly in the post-crisis period, the spatial separation of population growth and shrinkage is aggravating, accompanied by a series of changes in the demographic structure. Base on the perspective of demographic change, this article makes an in-depth analysis of the growth and shrinkage in Dongguan by using the Social Security Registration data. We summarize the characteristic of demographic changes in the size, age, gender and education after the financial crisis, and industrial economic structure of different towns. Moreover, we construct a panel regression model for exploring the factors and mechanisms that affect urban population growth and shrinkage. The result shows: 1) While the population size of Dongguan tends to growing in fluctuation, the population structure shows trends for migrant population localization, male and female more imbalance, younger and highly educated population. 2) Advanced manufacturing and modern service industries to promote city growing, and outward processing and manufacturing transformation failure will affect the city shrinking. 3) The spatial distribution shows the "growing in the north, shrinking in the south", forming a concentrated area where the central area growing, the northwest area and the southeastern area are shrinking. 4) Macroeconomic fluctuation, industrial transformation, technological innovation inputs and local development pathway have significant impacts on demographic growth and shrinkage in Dongguan. Based on statistical analysis and geographical detector from primary data, this article analyzes the differential community resilience and influential factors and causing reasons in Shenyang Tiexi District. The results indicate that: 1) The respective score of social resilience, institutional resilience and community capital in commercial-house community are higher than those in unit residential community. While the score of economic resilience and physical resilience in commercial-house community is lower than unit residential community’s. 2) Physical resilience and institutional resilience, rather than social resilience and economic resilience, exert a significant effect on community resilience. 3) The comprehensive causing reason of community resilience, contained institutional transformation, local government, economic development, community service, social and individual factors, is put forward. Under the impact of transformation of the relocation, industrial transformation etc, stronger adaptability and weaker learning ability are reflected in the urban regeneration, which is the comprehensive result of social resilience, economic resilience, institutional resilience and physical resilience. Since China’s Strategy Plan for Rural Vitalization (2018-2022) was issued in 2018, that will break the existing cultural pattern of rural living environment and form a new pattern in China. The new pattern will be the urban-rural cultural integrated development. In the new era of rural development habitat cultural environment, this paper analyzed the spatio-temporal basis and development dilemma of the rural living environment at urban agglomeration in the middle reaches of the Yangtze River. This paper focused on the quality measurement of rural habitat cultural environment and built a hierarchy of evaluation index system from several factors that affect the habitat cultural environment. By using complex theories and methods such as theory of human-land relationship, theory of complex system, theory of landscape ecology, methods of Delphi and AHP, spatial analysis methods of ArcGIS, the paper explored the spatial-temporal evolution of rural habitat cultural environment at urban agglomeration in the middle reaches of the Yangtze River from 2005 to 2015. Three highlights results were unveiled: first, the quality of rural habitat cultural environment has been showing a difference trend of increasing at urban agglomeration in the middle reaches of the Yangtze River; second, the quality of rural habitat cultural environment has been at the most excellent level in Yichang and Chang-zhu-tan regions; and third, the rural areas are developing rapidly in Wuhan and Nanchang. Traditional industrial bases, such as Hengyang and Changde, have been developed from fine level gradually reduced to poor or bad level. The quality evolutions of rural habitat cultural environment and subsystem are not completely synchronized. The habitat material culture is the basis of systematic evolution, and directly led the priority evolution of habitat institutional culture. The evolution of habitat spiritual-cultural environment lags behind rural habitat cultural environment’s and habitat institutional culture’s. The spatio-temporal evolution of rural habitat cultural environment is driven by four forces, including the support security forces of government system and mechanism, support force of modern agricultural industry system, demand force of multiple subjects, service force of rural public facilities. With the emergence of new ‘The Northeast China Phenomenon’, the transformation and sustainable development of the Northeast China were highlighted, and sustainable livelihood security needed to be improved urgently. Based on the framework of sustainable livelihood security analysis, the study constructed a evaluation system of sustainable livelihood security including 27 indicators in Northeast China by taking the 37 prefecture level cities of the Northeast China as the research object from 2003 to 2015. By using GRA-TOPSIS model, the study had a comprehensive measure of sustainable livelihoods security in the Northeast China. Based on spatial autocorrelation method, geographical detector and obstacle degree model, the study not only revealed spatio-temporal evolution of sustainable livelihood security, but also analyzed the causes of spatial differentiation and the diagnosis of obstacle factors in the Northeast China since 2003. The result showed that: 1) Sustainable livelihood security index (SLSI) in the Northeast China was on the low level as a whole, and the characteristics of spatial differentiation were obvious, but its regional difference reduced gradually in recent years. 2) The spatial agglomeration of sustainable livelihoods security in the Northeast China presented significantly, and the hot spots and sub hot spots showed the main area including the Shenyang-Dalian and Harbin-Changchun groups; the sub cold area and cold area were marginally distributed in less-developed areas, including the eastern Inner Mongolia Autonomous Region, the northern Heilongjiang Province and the southern Jilin Province. 3) Industrialization level, economic output, wage, emission intensity of sulfur dioxide and investment intensity are the main influencing factors of sustainable livelihood security in Northeast china. 4) The supporting capacity of resources and environment and economic productivity are the two short boards restricting the sustainable livelihood security improvement in Northeast China, and the most dominant type of economic efficiency is the most widely distributed area. Finally, this study put forward the factors of regional policy and system into the framework of sustainable livelihood security analysis. The research analyzes spatial pattern evolution of urban agglomeration economic links mainly by means of social network analysis, based on the strength characteristics of economic links using the strength matrix constructed by modified gravity model. The model is mainly corrected from three dimensions: the complementary between different industries, comprehensive economic quality and economical distance which considers both time and economy cost. The research, taking 17 cities in Shandong Peninsula urban agglomeration as study objects, reveals the spatial pattern evolution of economic links from 2006 to 2015 with the help of ArcGIS 10.2 and Ucinet 6.0 which can manipulate data and render images. The results are shown as follows: 1) The overall strength of economic interaction grows slowly despite of its low level and the directions of economic linkage between different cities vary a lot, which contributes to a more dense network; 2) The level of overall centricity degree grows slowly, which indicates a low liquidity of resources among cities in urban agglomeration. Moreover, the disparity between indegree and outdegree gets more and more obvious; 3) The members of urban subgroups is usually unstable and some of the subgroups are uncoupled with the distribution of administrative districts, which lead to a low economic level of some cities; 4) Jinan and Qingdao become the core cities of two different economic circles in Shandong Peninsula urban agglomeration, whereas the communications of resources and energies and industry connections between the two city subgroups is scanty. At last, through the study of influencing factors we found that innovations of transportation technology, changes of industrial structure and flows of essential resources become the main factors for the evolution of spatial pattern of economic linkage in this urban agglomeration. Tourism scenic spots are indicative indicators for the development of China’s tourism industry. Research on spatial distribution of tourism scenic spots has great significance for the optimization of regional tourism development. 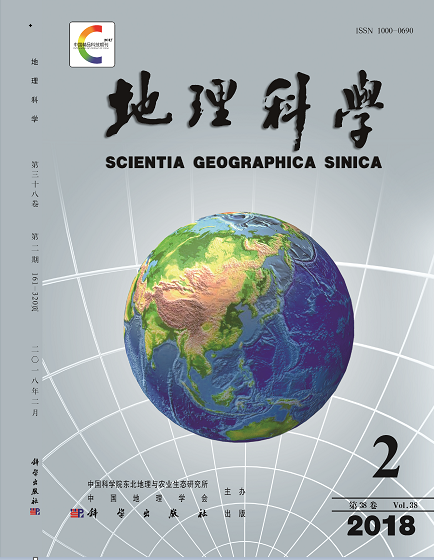 Based on the data of 3 228 more than 3A-class tourist scenic areas (spots) in China Hongkong, Macou and Taiwan are excluded, using the method of kernel density, average nearest neighbor, spatial analysis and other methods, this article analyze the level, type, the geographical distribution of the scenic spots in China. Research shows that China’s more than 3A-class tourism scenic spots have typical characteristics of type polarizable, regional differentiation and plate agglomeration. There is a great disparity in the density of scenic spots on both sides of the Hu line. There are a lot of scenic spots in half of the country in the Southeast especially in the Beijing Tianjin area, the Pan Yangtze River Delta city group, the Pearl River Delta city group, the Chengdu Chongqing Region, while the northwest and northeastern regions are less distributed. The distribution of tourism attractions in the middle east and western regions is extremely unbalanced. The middle east regions present between cluster and random distribution, while western regions is characterized by significant cluster characteristics. Different levels of tourist attractions show a different distribution structure. The spatial distribution of 5A-class tourist attractions in China is ‘cross-shaped’, including the Beijing Tianjin Hebei region which is centered on Beijing and the Yangtze River Delta, on Shanghai especially in the Yangtze River Delta. The distribution characteristics of China’s 4A-class tourist attractions along the Yangtze River and the Yellow River, are more obvious, which is showing the distribution characteristics of ‘two lines and two pieces’. The distribution of the 3A-class scenic spots in China is characterized by the linear distribution along the coastline and the agglomeration of the Chengdu and Chongqing Region. In addition, the distribution characteristics in different types of scenic spots in the three regions of China show great differences and different characteristics. The distributed diversity are related to the forming factors of scenic spots including historical popularity, quality of tourism resources, geographical environment, level of population economic development, historical and cultural district, traffic conditions and other factors. In the future, the development strategy should be optimized with regional balance, cross district coordination and classification optimization. Plutonium (Pu) is valuable a tracer for the study of marine biogeochemical processes, and an important element for evaluating the state of the marine environment. In seawater and marine sediments, it provided an effective tool for the studies of water transport in the marine environment, seawater intrusion, particle inventories, particle removal processes, the accumulation of pollutants, sediment age and other issues. In this article, the distribution of 239+240Pu activities, 240Pu/239Pu atom ratios and 239+240Pu inventories in marine sediments from China's marginal seas were analyzed. It was found that different regions of the marine environment show differences in the origins of the Pu, with global fallout and PPG (Pacific Proving Grounds) inputs being the two major sources of Pu. The 240Pu/239Pu atom ratios in the surface sediments from China’s marginal seas ranged from 0.158 to 0.297, and the activity range was 0.048 to 1.160 Bq/kg.The ocean is a continuous whole, and there was no simple linear relationship between 239+240Pu and 240Pu/239Pu in marine surface sediments.Using a simplified Pu two-end members model to calculate the ratio of PPG contribution 239+240Pu in China's marginal sea sediments range was from 0 to 68%. The data of Pu were discussed to have significance for understanding the sources and sinks of Pu in the ocean and marine environment. Land cover classification is the basis for geoscience and global change studies. It can provide essential information for modelling and understanding the complex interactions between human activities and global change. Remote sensing has been widely recognized as the most economic and feasible approach to derive land cover information on a large regional scale. Landsat satellite data are commonly used remote sensing data for land cover classification. The object-oriented classification method, which takes full advantage of the spectral, geometrical and textural information of remote sensing images and considers the spatial distribution characteristics and correlations of geographical objects, can mitigate the deficiency associated with the pixel-based approach. The purpose of this study is to deepen the application of object-oriented classification method that is utilized to extract land cover information automatically and quickly from the satellite imagery. Taking the Kunyu Mountain of Jiaodong peninsula in Shandong province as the study area, land cover classification was conducted by using the object-oriented classification method on eCognition software platform, with Landsat 8 OLI satellite image in 2015 and digital elevation model (DEM) as data sources. Firstly, Landsat 8 OLI data of high quality was selected, and preprocessed by radiometric calibration, atmospheric correction, accurate geometric correction, image registration and fusion. Feature parameters including spectral (normalized difference vegetation index (NDVI), band brightness), shape (area, roundness, rectangular fit), and topographic (DEM, slope) characteristics were calculated. Then, the land cover information was classified into cropland, grassland, needleleaf forest, broadleaf forest, built-up land, water bodies, and barren land by the object-oriented method following the steps of multi-resolution image segmentation, object feature extraction, and classification rule set construction. Finally, the accuracy of this method was evaluated and compared with that of the pixel-based supervised classification method and ground validation sampling points. The results indicate that land cover information extracted by the object-oriented classification method using Landsat 8 OLI data is well consistent with the true condition on distribution and range of each land cover type in the Kunyu Mountain. The dominant type of land cover is needleleaf forests, with the area of 1546.81 km2. The overall accuracy and Kappa coefficient of the method are 91.5% and 0.88, respectively. The production accuracy is higher than 87% for needleleaf forests, grassland, water bodies, and built-up land. By comparison with the maximum likelihood supervised classification method, the overall classification accuracy and Kappa coefficient of the proposed method in this study are increased by 14.7% and 0.17, respectively. This means the moderate resolution Landsat 8 OLI image, combined with the object-oriented classification method can effectively improve the accuracy of land cover information extraction in the typical vegetation areas. This study will provide a credible approach and valuable example for extracting and monitoring regional land cover type, and broaden the application vision and the scope of ecological remote sensing investigation in terrestrial ecosystem. On the high-resolution remote sensing imagery, the feature of the ground object spectra is very rich. The spectral differences are increased within the same type, differences between the categories are decreased, and the phenomenon is obvious that the same object with different spectra and the different objects with the same spectrum. Under high-resolution remote sensing imagery, the application of shallow classification models for classifying wetland remote sensing cannot unearth sufficient information, while the adoption of deep-structure models for classification of high-resolution wetland remote sensing images can fully utilize the spatial structure information of images. Deep-featured representations allow layered learning from simple concepts to higher-level complex patterns such as textures, segments, and objects. Convolutional neural network is a very representative network structure in deep learning, and it has been gradually applied to the classification of remote sensing images in the past two years. This article constructs a proper framework for the study of area image classification by selecting the size of convolution kernels and pooling kernels, classifiers and activation functions, and optimizing the number of convolutional layers. A study on the classification of different vegetation types in Sanjiang Plain Honghe National Nature Reserve is carried out through experiments. A comparison of accuracy is made between support vector machines method based on the spectrum and the support vector machines method based on the texture and spectrum. Experiments show that: 1) When adding the texture spectral features to the classification method, the classifying accuracy by SVM method based on Pixel is slightly improved compared with the SVM method based on spectrum. The CNN classification method based on patch with spectrum, texture, size, color and other semantic features, of which classification accuracy is generally higher than about 4% of the TSP-SVM method. 2) Pixel based classification methods can produce salt and pepper noise effects for misclassified pixels, and it’s hard to deal with the abundant Information from high-resolution data. The key feature of CNN’s algorithm is that it does not require manual pre-extraction of features, and the processing and classifying of images is performed in an end-to-end manner, so it has a stronger generalization ability. 3) However, in the experiment, it is also found that , on the one hand, the accuracy of the CNN classifier on the boundary is not as good as that of the SVM classifier, and there is a phenomenon of uncertainty along the boundary of the object in the classification, which leads to excessive smoothness to a certain extent. On the other hand, in the use of the CNN classifier, although the spectral features are significant, there is little spatial information and it may be misclassified. The experimental results conclude that the CNN as a deep structure classifier explores the complex spatial patterns hidden in high-resolution remote sensing images, and it can extract more abundant semantic features of the ground. Therefore, the use of the CNN method is more accurate to classify high-resolution wetland remote sensing images, and it can provide decision support for real-time monitoring, management, and protection of wetlands. In recent decades, in the context of global warming and rapid urbanization, increasing flood and waterlogging have resulted in a great threat to urban socio-economic development and public safety, and have been one of the hotpots in the field of natural hazards research. In this paper, the city center (within outer ring) of Shanghai, China has been selected as the study area. A simplified 1D/2D hydrodynamic model (FloodMap) was used to derive fluvial flood inundation associated with urban road network. Furthermore, GIS-based network analysis (New Service Area and New Closest Facility) was applied to evaluate the emergency responses accessibility of critical public service sectors (Public Safety 110) under normal and multiple scenarios of fluvial flooding (current state, 2030s and 2050s). The results show that, 1) at normal (smooth traffic) condition, emergency response service could cover almost the total research area, which could reach the majority (80%) of the study area within 15 minutes at the condition of extremely congested roads. 2) During 1 in 100 year flood scenario, part of the road network (mainly at the bank of Huangpu River) loses its capacity. As the interruption of the surrounding road network, the number of public security agency which lost the emergency response capability has also increased significantly. Among these, the most serious condition is of 22 police stations who lost emergency rescue capability, while the service area of emergency department have obviously decreased. 3) During 1 in 1000 year flood scenario, the response areas were further reduced than normal and about 1/6 of the public security organization lose their emergency response ability. Under the condition of traffic congestion, 30% of the central city couldn’t get emergency rescue. To conclude: in the flood situation, fluvial flooding have a serious influence on urban road network, leading to travel delays and disruption of emergency vehicles, along with emergency service, whose geographic coverage is smaller than normal. As the high vulnerability areas (shanty towns) mainly located in the Huangpu River floodplain, emergency response for some parts of this zone will be delay and even unreachable. The study suggests that the assessment of urban police (110) emergency response under fluvial flooding scenarios are proved to be practical, and will provide theoretical and scientific basis for formulating prevention and response measures. Snow as a land-cover type that is mainly distributed at the high latitude and high altitude regions. Snowfall, as are main precipitation type in mountainous areas, presents significant temporal and spatial difference which was affected by climate change. In this study, based on APHRO’s dataset and temperature threshold model to analyze snowfall changes in the Tianshan Mountains during 1961-2015. Results indicated that: 1) Temperature showed increasing trend in the Tianshan Mountains since 1961, with a rate of 0.027℃/a. And temperature increase rate in winter was higher than that in summer. Meanwhile, the average air temperature of elevation above 3 000 m is rise to around 0℃ during 1961-2015. 2) Precipitation exhibited significant increasing with a rate of 0.42 mm/a (P<0.01) in winter, while decrease in spring and summer. 3) Snowfall changes were characterized by temporal and spatial variations. Snowfall presented positive relationship with air temperature in the regions with elevation over 3 000 m, while negative relationship in regions with elevation below 3 000 m. 4) Maximum snowfall temperature is a key factor to understanding changes of snowfall under warming. When mean temperature is below/above maximum snowfall temperature, snowfall usually increases/decreases with increased warming. Therefore, study on the snowfall variations in mountainous areas can be very helpful to understand the effects of climate change on hydrology process in mountainous areas.